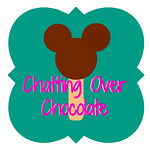 Chatting Over Chocolate: Five Loves on Friday // Highlight: We Appeared in an Official Disney Video! Five Loves on Friday // Highlight: We Appeared in an Official Disney Video! Happy Friday, friends! I hope you all have enjoyed a wonderful week! Ours has included some sickness and car issues, but while it's been far from perfect, there's always something to be thankful for! Today I'm excited to highlight a handful of things that made my week! One // We appeared in an official Disney video! One of the highlights of our recent Disney World vacation was attending our first Disney Vacation Club event at Epcot, Moonlight Magic! Just before the evening's party exclusive fireworks show, my family was approached by someone who worked for Disney. He said they were looking for a family to feature in a video they would be shooting of the fireworks display and that they'd been watching us and really liked our energy. (We were being really silly and enjoying our family time in the fun party atmosphere, but had no idea anyone was looking!) He asked if we'd be interested. Of course we said, "Yes! ", to this unique and magical request! We were brought to a special viewing spot along the lagoon where a crew and cameramen were set up. Soon multiple people came to talk to us about what to expect. Each member of my family was asked to fill out paperwork and sign release forms. After chatting a bit with the nice camera crew the fireworks began. It was surreal being watched as we watched the incredible fireworks display before us! We were told that the footage may be used on social media and in various places. We'd been on the lookout ever since for the footage to pop up somewhere! This week we finally found it, the excitement of which easily earns itself a spot at the tip top of my loves list! 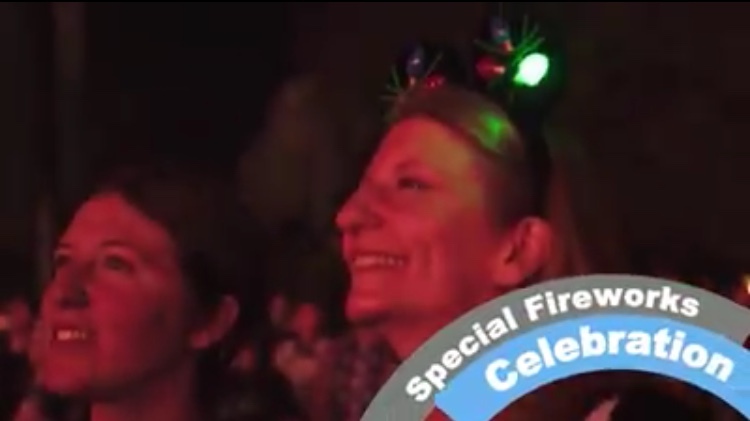 You'll see my oldest daughter and I smiling up at the fireworks during the #1 portion at the end of the video. We were so glad that our vacation just happened to line up with one of the two Disney Vacation Club member exclusive events held at Epcot last year! It was such an unforgettable evening! I'm overjoyed to have such a fun keepsake to look back at and remember the magical experience! My oldest daughter has spent the past year going through a piano program. She spends hours at the keys and thoroughly enjoys it! This week she showcased her continually improving skills, putting on an eight song performance for us. She did an excellent job! My mama heart couldn't be prouder seeing her continue to grow in something that she's passionate about! Another highlight of the night was watching my husband as she made her way through her set list. A musician himself, he was absolutely beaming with pride as he watched his firstborn play! Three // We secured our reservations at Disney's Hilton Head Island! A while back I mentioned that our upcoming vacation plans include visiting Hilton Head Island along our road trip from the Midwest to Disney World. 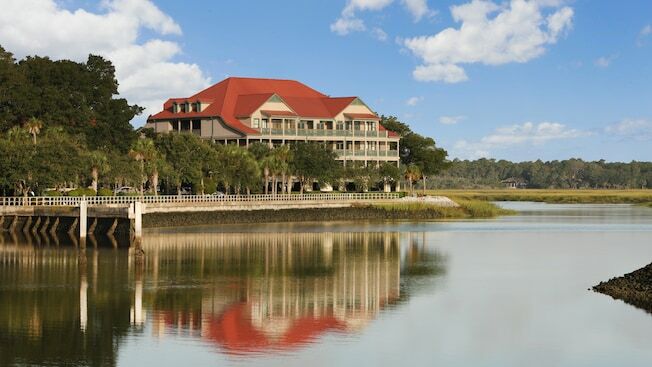 We planned to book a studio at Disney's Hilton Head Island Resort using our Disney Vacation Club points. Being that it's not our home resort we had to wait until we hit the 7 month mark to book a room there. When we hit that day this week we were tickled pink to see that there was still availability for the date we wanted! I'm very much looking forward to our first stay at a Disney Resort that's not on either Walt Disney World or Disneyland property! This week about another four inches of snow fell in our area. My husband has been under the weather, so Princess headed outside with me to clear it. She grabbed a shovel, and said, "Okay, let's have some fun!" ... You find the fun, and snap, the job's a game! My heart is full thinking about what a great help Princess truly is, and the attitude she tackles things with is nothing short of inspiring! 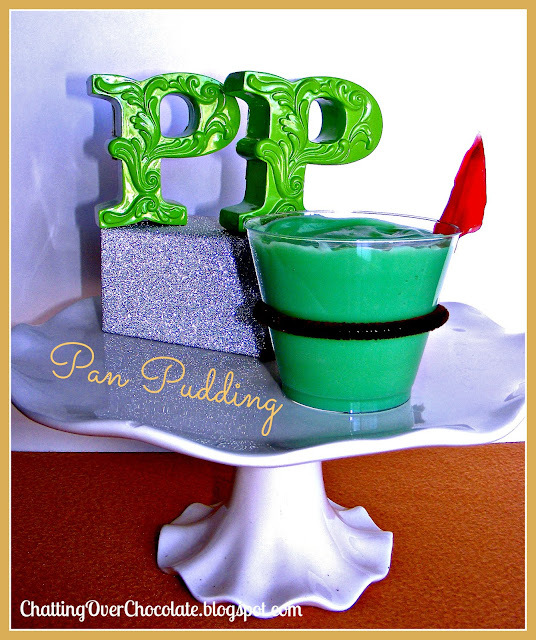 This week marked an anniversary for both Peter Pan and Pinocchio. Clearly such an occasion brings back Disney memories and thinking on those is a highlight of any week for me! 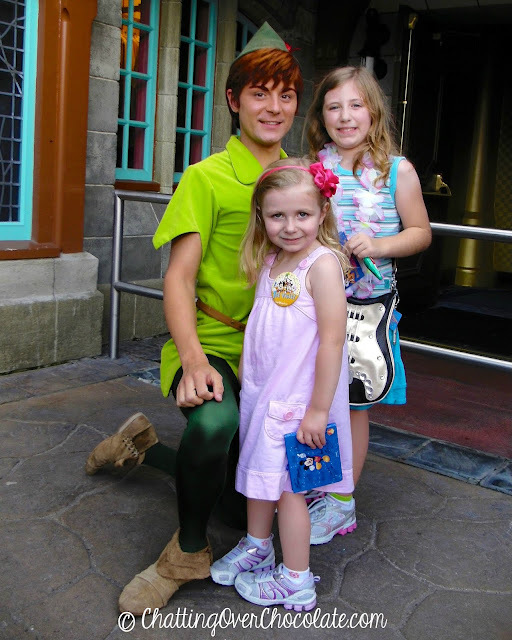 Here are a few of my favorite snapshots with each of those beloved characters, followed by a couple Flashback Friday links to posts I shared in celebration of one of Peter Pan's previous anniversaries! This will forever be one of my favorite character meet and greet snapshots. 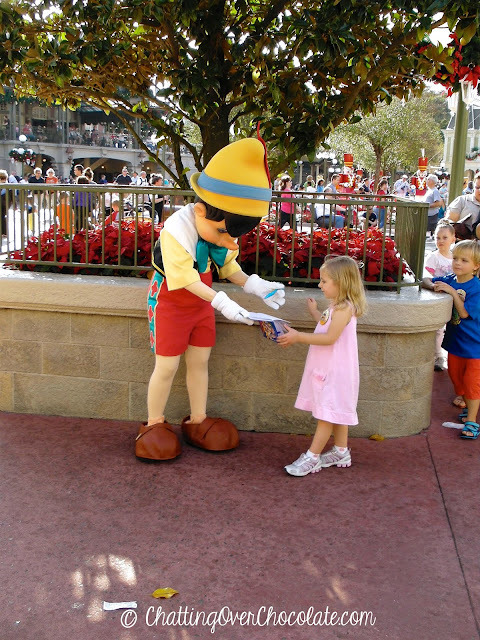 It was taken during Little One's first trip to WDW back in 2009! Look at how little the girls were! I only wish they could stay forever young just like Peter Pan! 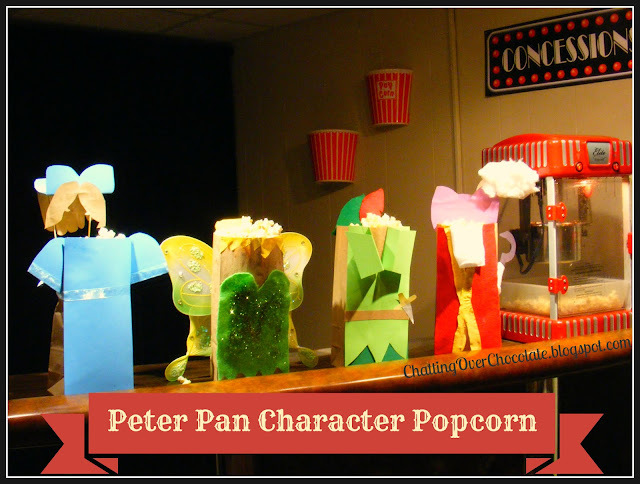 In this post I show how I made each of these themed popcorn bags for a Peter Pan Family Movie Night! You're famous, what a fun experience and keepsake! I love the fireworks awe in both your sweet eyes! Look at your lil girlies, so precious. And look at your sweet shoveler, My Mr. Nine is out right now, I can hear him showing the front walk. 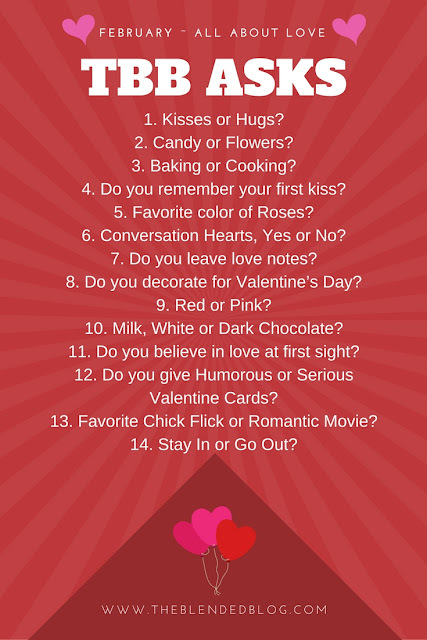 I'm in baking cookies and tending to our youngest. I will pray all your family is healthy in no time too. Isn't it great to have kids that tackle things with gusto! Love you friend, hope its a cozy weekend! That is so cool you are in a Disney video! I want to stay at an off Disney site Disney hotel too. 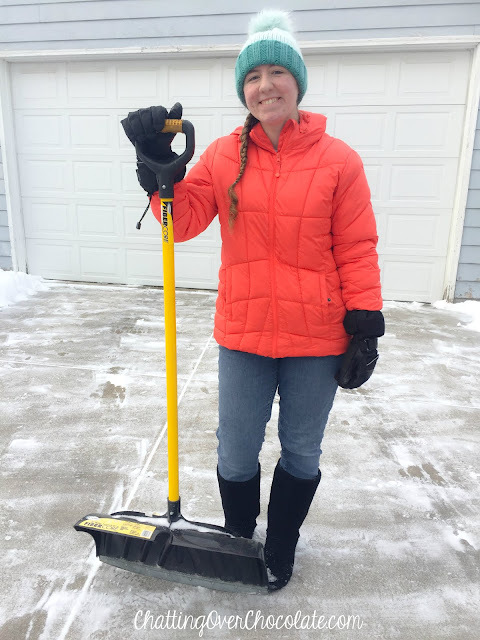 My kids helped shovel this week as well - yay for helpful kids and making it fun! It was so fun to see a couple of my favorites on an official Disney video! What an incredible experience! So glad you're so willing to share the magic! Princess is certainly one of a kind! She's helpful, ambitious, positive, creative, witty, AND she's truly beautiful inside and out! I look quite forward to your trip to Hilton Head! Being a fan of lighthouses, I cannot wait to see the pics you snap while staying there! Your girls sure were adorable! The best thing--that hasn't changed one single bit! <3 While they've grown up, they're still the sweetest! Happy Friday, sweetest friend! How awesome being in a Disney Video! I'm so happy for you and your sweet family! Yay for a trip to Disney's Hilton Head Resort! I've always wanted to go there and can't wait to hear what it is like. I'm also a big fan of road trips that sounds so fun! What a great daughter you have, offering to go outside and shovel. We had a fairly big snowstorm today and all I did was moan and groan while shoveling our driveway. I wish I had your daughter's sweet spirit! Have a wonderful weekend! How cool is it that you’re featured on an official video! And i have heard such good things about Hilton Head! And yay to having fun shovelling!! That’s so cool you’re in a Disney video!! You’re famous! ;) I hope your weekend is going great!! How fun is that being in a Disney video?!! I cannot imagine how excited you guys must have been! I love all of the Disney fun your family has! 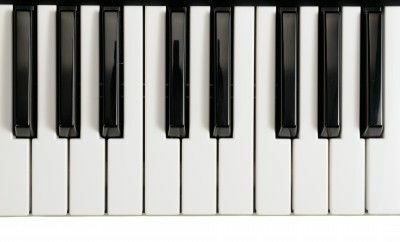 Congrats to your daughter on her piano performance. Both my children play on the piano that I played on myself when I was a child! It is very special to see the hard work and practice pay off. I hope your husband is feeling better and that you had a great weekend! How fun to be in the Disney video! That's so exciting that you got to be in a Disney video. 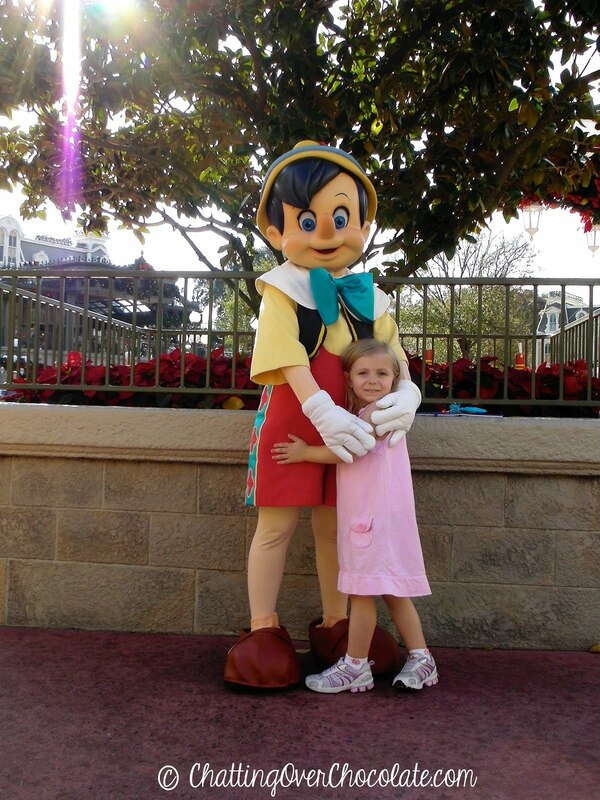 We stayed at the Disney resort on Hilton Head Island last summer. We loved it. I hope you have a great time! How cute that you guys were in the Disney video. I am dying to take my girls to Disneyland/World.